Image caption Jamie Oliver has paid tribute to Patricia Llewellyn on social media. Patricia Llewellyn, 55, from Newcastle Emlyn, spotted Oliver "doing spinach in the background" of an episode of BBC2's A River Cafe Christmas, and they created The Naked Chef. 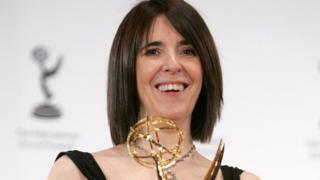 She also co-founded a company with Ramsay to produce all of the chef's television series. Oliver said she was "one of the most gifted matriarchs of the TV industry". In a tribute on his Instagram account, celebrity chef Jamie Oliver said: "Sadly today I found out my dear friend and the producer that discovered me 20 years ago as the Naked Chef passed away losing her battle to cancer. "People often said in the Naked Chef, who is the voice that asks you all those questions and that was dear Pat." He added: "Her ability to spot talent and her timing together with oodles of creativity and sheer drive made her a real force. She will be sorely missed." Ms Llewellyn joined production company Optomen in 1994 and was its managing director between 2005 and 2016. In 2008, she co-founded One Potato Two Potato with Ramsay and worked on his shows including Gordon Behind Bars, Kitchen Nightmares and Hotel Hell. She was responsible for selling the two independent companies to All3Media in 2010 for about £40m. Jane Turton, All3Media chief executive, described her as an "extraordinary woman" and "fantastic business leader". Can Jamie Oliver help Bristolians cut down on sugar?